Here, then, is surely one of the greatest pieces of music ever committed to vinyl. 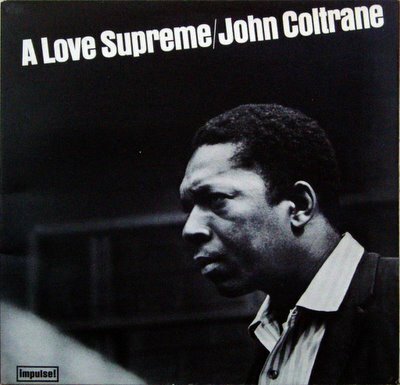 John Coltrane's 'A Love Supreme' has long been considered a classic, and rightly so. Never before or since were the realms of music and spirituality brought together in such harmony. For 30 years we all grew to love the standard versions of these 4 pieces. According to legend there were more takes, and in particular these 2 takes of 'Acknowledgement' featuring a sextet comprising Coltrane, Tyner, Garrisson and Jones as normal, with the addition of Archie Shepp on tenor and Art Davis of bass. The story was that Coltrane himself had destroyed the tapes - recorded over them at some later stage. But miraculously these 2 takes survived, and were released last year as part of a 2-disc deluxe edition of the album. Not for nothing have these takes been described as 'The Dead Sea Scrolls of Jazz'. Despite Trane's appreciation of Shepp's talents, there is little evidence on record of them playing together. Shepp does appear on 1965's 'Ascension', but as part of a much larger ensemble, and his opportunities for interplay with his mentor are limited. That deficiency is made up for on this recording, which is largely a conversation between the two tenors. It's incredible to hear a familiar piece of music being bent out of shape - Shepp is clearly exerting a strong influence on trane here - his encouragement helps to take the playing further 'out' than on the better-known version. It's also wonderful to hear the contrast between their sounds - Shepp's angry bark against Coltrane's much smoother tone. The increased sense of freedom is not only confined to the horns - the rhythm section sounds notably looser (and more funky), helped not only by Shepp's presence, but also by the stellar performance of Art Davis. Both takes are interesting, although to my ears the first is superior, owing to the greater dominance of Shepp on this run-through. It's worth pointing out that the sound on these takes is noticeably less good than the main album, probably due to the audio restoration involved. The first even has a few tape drop-outs, but they don't distract you from enjoying the performance. The inclusion of these 2 takes on the deluxe edition of the album makes it a worthy purchase, even if you already own the original LP.